It may not look like it, but this 11 foot wide sculpture is the original model for the iconic Monolith used in the film, 2001 and it is on permanent display in St Katherine Docks, next to Tower Bridge. When Stanley Kubrick wanted a monolith for the making of 2001, he commissioned a local plastics firm, Stanley Plastics to cast the monolith out of a solid lump of transparent plastic. However Kubrick was disappointed with screen tests and the sparkling clear polymer block was eventually rejected as a prop in favour of the dense, black basalt that was imported from Scandinavia and is now such an icon of film history. Personally I am quite pleased as the black monolith is more mysterious a shape in large part to being opaque. A transparent monolith would have lacked mystery. 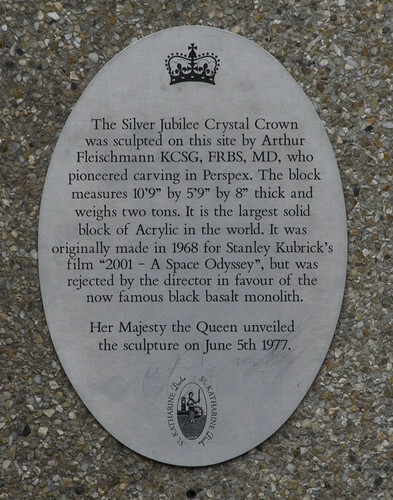 Anyway, that unwanted, and quite massive lump of perspex then sat in the Boreham Wood film studios until the Bratislavan born, London resident, sculptor Arthur Fleischmann acquired it. His interest being no doubt the fact that this was at the time the largest single block of perspex ever cast – and he was a noted artist working with plastics. 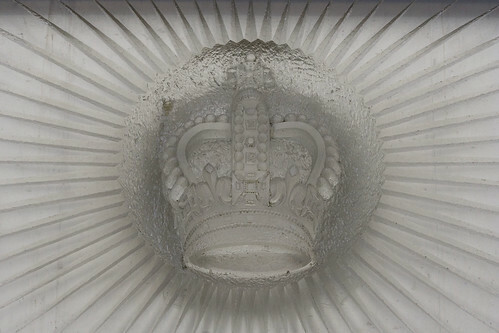 The block was kept in storage by Talbot Designs until Fleischmann received the commission to make a crystal crown for the Queen’s Silver Jubilee Celebrations in 1977. It was now that the transparent Monolith had the crown carved into its face and gained the perspective that we can see today. A dedicated open-air rotunda, known as the “Coronarium Chapel” was constructed, and the perspex block displayed within after being unveiled by The Queen. 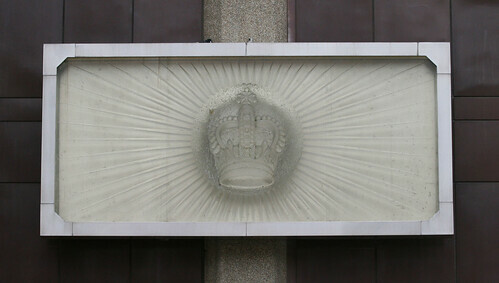 In 2000 the Crystal crown was moved from its original home and moved just a few metres to the north elevation of the Thistle Hotel (map link). A plaque to commemorate the resiting was unveiled by Joy Fleischmann that year. Sadly, mounting it on the wall means what was once a glassy transparent sculpture now looks more like a translucent lump of cheap plastic. I really hope that one day it can be free standing again, as the photos of it in that guise look quite stunning and truly deserving of its title “the crystal crown”. Oh, and what happened to the original Rotunda space it sat in? That has been converted into a branch of Starbucks. Surely at 8″ thick, the other dimensions should have been 2′ 8″ and 6’0″? All the monoliths in the book were dimensioned in the ratio of 1:4:9 (square of one, square of two and square of three to indicate they were manufactured). So the acrylic should be 8:32:72 (8x the 1:4:9 ratios) which make them 8in, 2ft 8in and 6ft. Now, frankly I agree that the current presentation of this humongous transparent block is terribly dull, and does not take advantage of the material’s true potential. What I would do is show it free-standing as it was originally intended, and install a set of LEDs that would transmit the light from the base. I featured it in my book, but have recently failed to get a reply from family etc re another effort to get it resited. Dock management have been asked to clean it (now it is just gathering dust)!!! Without success!!! Any ideas would be deeply appreciated. What book is it you’ve written? My Grandafther was the developer of the Docks, perhaps our efforts combined may be of more luck. It is a great shame what has become of this. A Starbucks oh the irony. Good news- the new owners of St Katharine Docks have commissioned a report on how to catalogue, look after and restore (as necessary) what I refer to as ‘today’s treasures at St Katharine’s’- I am cautiously optimistic that the overdue overhaul will now take place soon. If anyone wants to contact me, please do, on the historyofstk@outlook.com. I cannot commend Christopher West’s book too highly for anyone interested in the history and development of St Katherine Docks, one of London’s hidden jewels. It is entitled “The Story of St Katherine’s” and is on sale in shops on the docks and online. Pending it being re-sited, the Coronarium is best viewed at night, when it is illuminated from behind. Regrettably, the Crystal Crown is still gathering dust and has not been cleaned- just give me a high set of steps and I’ll do it!! Also, Paula Haughney’s sculptures and David Devereux’s acrylic panels are also now under threat. Granted a nit pick, but a shame the plaque got the date wrong. 2001 is a 1968 film, yes, but the plexiglass was made in 1965, ’66 at the latest.